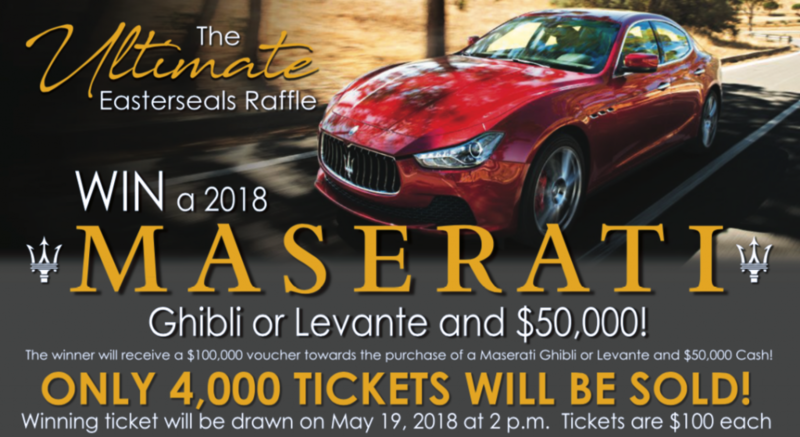 EXPIRED – WIN A 2018 Maserati Ghibli or Levante AND $50,000! Easterseals Raffle Recently updated ! The winner will receive a $100,000 voucher towards the purchase of a Maserati Ghibli or Levanti and $50,000 Cash! What could be better than winning a new car plus $50,000? Answer: Helping people with disabilities lead more independent lives. Winner need not be present to win. Confirmation of your ticket numbers will be sent to you upon receipt of your application and payment. For nearly a century, Easter Seals Michigan has empowered extraordinary individuals to live more independent lives. Our story has evolved over time, but our purpose remains the same. We help people with physical, behavioral, or developmental challenges live extraordinary lives. Last year we served over 12,000 people of all ages, partnering with each individual to improve their quality of life and prosper, undeterred by physical disabilities, behavioral health challenges and autism spectrum disorders. We continue to adapt, responding to the needs of the community and tailoring services to meet the unique needs of each person and their family. CENTURY 21 Town & Country has raised over $18 million for Easter Seals and is the number one fundraiser for Easter Seals in the CENTURY 21® system. CENTURY 21 Town & Country is also the number one CENTURY 21 firm in Michigan, a consistent Quality Service Award winner, and has seven offices in the Metropolitan Detroit area. The firm also has an award-winning Relocation Services Division.